KwaZulu Natal Emergency Medical Services (KZN EMS) is one of the three core functions within the Department of Health, which aims to provide a quality, efficient, professional and caring emergency medical and rescue service throughout the Province of KwaZulu-Natal. KZN EMS is a specialized 24hrs ambulance service catering for the needs of the people of KZN, from the city centers to the most rural areas. 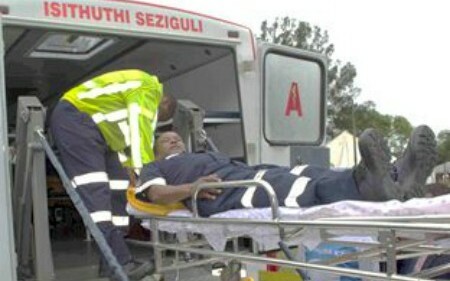 There are several functions provided by KZN EMS. Emergency Operations is the largest section of EMS where Medical emergencies are responded to and patients are treated in the pre-hospital field before being transported to hospital for further care through the utilisation of specialised vehicles, equipment and skilled paramedics. KZN EMS provides a rescue service which includes rescuing people who are entrapped in a motor vehicle after an accident to falling down a cliff. 4×4 rescue vehicles have been converted to carry specialised equipment, including the “jaws of life” and emergency lighting which is required to perform medical rescues. The weight and bulk of this equipment is taken into consideration when converting these vehicles. These vehicles are not designed to transport patients but have medical equipment on board and are staffed by medical personal that have a medical and rescue qualification. Hospitals are staffed and equipped to provide different levels of care, KZN EMS transfers patients in between hospitals depending on the patients’ medical needs. There is no decrease in the level of care provided to the patients during the transfer as appropriately trained paramedics provide continued medical care during the transfer. These practitioners provide Basic Medical Care interventions to patients in Emergencies. This includes CPR, stopping of bleeding, helping women in labour and other non-invasive procedures. To be Basic Life Support you need Matric, Code 10 Drivers License and PrDp. To be qualified as a Basic Ambulance Attendant (a one month course) and be registered with the Health Professional Council of South Africa. These practitioners provide Intermediate Medical Intervention including IV therapy (drips) Bronchodilators, Defibrillation (shock) chest decompression etc. To be an Intermediate Life Support you, need 1000 operational hours as BLS, pass the pre-course examination for entry into ILS course, then complete the four month training course and register as ILS at the HPCSA. Plus all other requirements as for BAA. Part of the selection criteria for KZN EMS staff to attend the ECT course the staff must be an AEA and pass several other entrance exams, including a test paper and fitness test. There is then followed with two years for formal training. The scope of practice of an ECT is only slightly less that of the advanced life support paramedics. The vision for is that ECT’s replace the ILS as the mid-level worker in the EMS field. This category of staff are pre-hospital Advanced Skills providers. This includes: Advanced Airway Management, IV Drug Therapy upto schedule 7 drugs, Advanced midwifery , Advanced Resuscitation, Aviation Medicine, Marine Medicine. South African advanced life support paramedics are in high demand throughout the world due to the nature of training and skills. Training can be done either by being an ILS (with a 1000 hours of experience) and then attending a one year training course to be a Critical care Assist or attend certain Universities of Technology who offer the four year long Bachelor of health sciences. Each district has an Emergency Management Centre where emergency calls are received, triaged (the calls are placed on order of medical priority, not first come, first serve) and then an ambulance is dispatched to the case. The control rooms play a vital function as this is where the emergencies are coordinated. This is a large component of EMS. Its main function is to transport patients, normally with chronic illnesses, who are not ill enough to require to be transported in an ambulance but who require transport for non-emergency referrals between Hospitals and from PHC Clinics to Community Health Centres and Hospitals. These trips are planned and the patients attend prearranged appointments, after being referred to a particular clinic. The appointment letters are normally used to book places on the busses. The patients are seen as out patients at these hospitals and are transported back after their appointments. Vehicles ranging from mini busses to large 60 seat buses are used to transport these clients. Some of the buses have had conversions done to allow for stretchers to be lifted into the bus by an hydraulic ramp. These buses are able to carry seated, wheelchair and stretcher patients. There is basic medical equipment on board and there is medical staff other than the driver attending to and monitoring patients during the trips.